By April Hunt on Monday, December 29th, 2014 at 12:00 a.m. 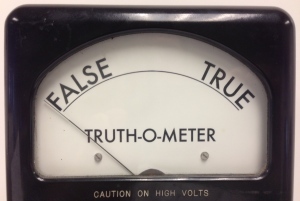 The midterm elections provided plenty of fodder for the AJC’s Truth-O-Meter in 2014, the fourth full year of digging through hundreds of claims and verbal attacks for PolitiFact Georgia. As in years past, the vast majority of the statements we fact-checked in 2014 were missing some context or were misleading. Some were exaggerated at best and, at worst, were downright wrong. PolitiFact Georgia published 249 fact checks in The Atlanta Journal-Constitution through Christmas that were written either by our PolitiFact team here, our colleagues in Washington or by PolitiFact partners in other states. Of them, 17 percent awarded a rating of True – a slight improvement from last year’s 15 percent. More significantly, more of our politicians than ever before avoided making outright wrong, or outrageously incorrect, statements. We gave the dreaded Pants On Fire and False ratings to 15 percent of the claims this year. That’s the lowest annual percentage since we started, and less than half of the 31 percent of fact checks that earned the lowest ratings in 2011. Newsmakers are getting better at citing their sources when making statements and taking care in how they make their claims. That shows in the 23 percent of claims rated Mostly True – the first time that category has edged out Half True in the final tally. About 22 percent of claims earned a Half True rating. Both mean some nuance is missing or clarification is needed for a statement to be accurate. And they are clearly more truthful than the 20 percent of claims rated Mostly False – or a typically misleading statement with just an element of truth. And for those doing the math, that remaining 1 percent of fact checks fell on either the Obameter or Deal-O-Meter. Gov. Nathan Deal was ruled as keeping one promise from his first campaign, while both he and President Barack Obama were found to have broken one promise last year. We fact-checked statements by both leaders, their parties and others in the political realm throughout the year. In Georgia, where Republicans dominate both statewide offices and the congressional delegation, the GOP was the focus of more of our review. We fact-checked 117 statements by Republicans and 67 by Democrats this year. We also did one fact check on a claim made by a Libertarian and nine by independent people or groups. The elections – especially the race for an open U.S. Senate seat and the battle for governor – were the focus of much of our work from the summer through the fall. The governor’s race focused heavily on education and the economy, with several claims about school funding drawing our attention. Senator-elect David Perdue’s business record was repeatedly a topic of fact checks, first in the GOP primary and then in the general election against Democrat Michelle Nunn. Nunn’s tenure at the Points of Light foundation also became an issue in fact checks. And the conversation about the Affordable Care Act, or Obamacare, spilled over from last year’s fact checks and into both races. The governor’s race included claims centered on the state’s decision not to expand Medicaid as part of the plan, while the Senate race raised issues of the legislation’s future. On the most local of fronts, there was one particular bright spot. Of four fact checks of statements by Atlanta Mayor Kasim Reed or his staff, two were True. The remaining were Mostly True. We’ll see whether anyone can top that level of accuracy in 2015, which we expect to kick off with headlines revolving around education, medical marijuana and transportation taxes when the state Legislature convenes in January. The GOP-controlled Congress is also expected to make news next year, with Georgia lawmakers at the fore in both the House and Senate. On the national, state and local levels, PolitiFact Georgia will be watching and checking the facts. Stay tuned.